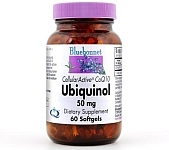 Bluebonnet’s Cellular Active® CoQ10 Ubiquinol 50 mg Softgels provide the reduced, active antioxidant form of CoQ10 (Ubiquinol) rather than the oxidized form of CoQ10 (Ubiquinone) currently sold on the market, which must be converted to the reduced, active antioxidant form in the body. Available in easy-to-swallow softgels for maximum assimilation and absorption. Directions: As a dietary supplement, take one softgel daily, preferably with a meal or a directed by a healthcare practitioner.